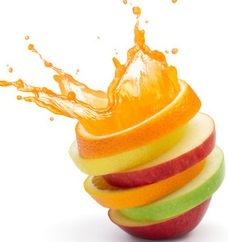 Juicing is a simple way to absorb the concentrated form of fruit and vegetables. Juicing bypasses the digestive process and releases the nutrient-rich fluid from the vegetable/fruit fibre for immediate absorption. A major nutrient in juice is Potassium which is also the predominant intra-cellular nutrient. This gives immediate benefits for cellular activity which can otherwise become weakened by exposure to external toxins such as petro-chemicals, excess dietary sodium, and a lowered intake of fresh vegetables. Beta-carotene is also important as an antioxidant for dealing with ‘free-radicals’ ie harmfully charged molecules which are disruptive of cellular processes. Chlorophyll is another plant nutrient which helps to maintain lymphatic system cleansing. Another factor with juicing is that the vitality of the juice represented by enzymes diminish within 15-20 minutes of juicing. Juices should preferably be drunk as soon as they are prepared. Juicing has an overall detoxification function and has been used worldwide in clinic spas for the treatment of chronic disease. The Gerson programme is an example of a spa where juices are used extensively for health recovery. In this and similar spas only organic fruit and vegetables are used as it has been observed that the release of the juice fluid from the plant fibre can also cause the release of chemical pesticides into the juice. Consequently these chemical pesticides are more concentrated than if they were metabolised during the digestive process. Juicers can also be an issue as most high street sold juicers are of the centrifugal type and do not extract the full amount of juice. They also release an electrical charge into the juice caused by the centrifugal blade rotation. 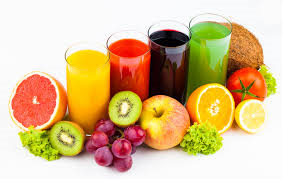 This can weaken the therapeutic benefits of the juice. Pressure cone juicers are more expensive but guarantee a higher and healthier yield of juice. Prepare and drink daily one 250ml glass of mixed carrot and celery juice in a 1:1 ratio, adding beetroot and a small amount watercress/ parsley. Other alternative combinations can include apple, cucumber or lettuce. Julio is a Nutritional and Bioresonance therapist at Natureworks, who works with a variety of health conditions.